In the first half of the 19th. Century, a number of Russian ships visited the newly found British Colony at Sydney Cove. 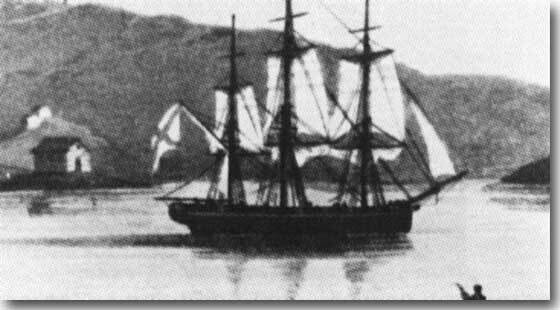 However, the first to make its way below the equator, and call in at Sydney, was the sloop Neva, under the command of Lieutenant Gagemeister Leontiy Andrianvich, his ship visited over the 16th. of June to the 1st. of July in 1807. The three masted Russian Sloop Neva visited Sydney in 1807. This small vessel of only 350 tons had been built in London, and formerly named Thames, her crew: 5 officers, a doctor, a Commissioner of the Russian American Company ( RAC ) who owned the ship, and 36 seamen. Leontiy Andrianovich Captain of the Sloop Neva. The Captain had graduated from the St Petersburg Naval Cadet Corps, having served in the Baltic Fleet, in the Atlantic, and Mediterranean, he had also been a volunteer in the British Navy, and drawn favourable comment from Lord Nelson. Now at age 27, he was well educated, and proficient in Russian, German, English, French, Spanish and Portuguese languages, indeed he had been a busy young man. 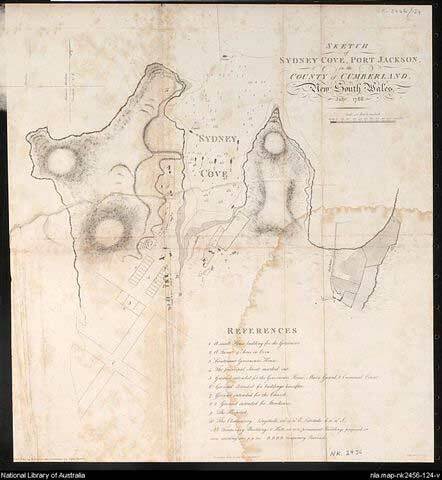 Sketch of Sydney Cove 1788. Neva sailed out of Kronshtadt on the 20th. of October 1806, called in at Brazil in the following February, but the prevailing bad autumn weather in the South Atlantic precluded her Captain from attempting to round the dangerous Cape Horn, and he chose the long way round to visit Australia. He piloted Neva eastwards across the Atlantic and Indian oceans, traversing the "roaring forties" his ship not in sight of land for three months. During WW2 we were often at sea for many months without being in port, but I find it hard to imagine life at sea in a tiny vessel, the only motive power that provided by the wind. To be at the absolute mercy of the elements, to be becalmed, whilst living in cramped quarters, and not to be in charge of one's destiny, I don't think I would have coped at all. At long last Van Dieman's Land was in sight on the 20th. of May, now the little ship coasted up the eastern side of Australia, to be at the entrance to Port Jackson on the 15th. of June 1807.
into Port Jackson in 1807. At that time, Captain Bligh was the Governor of the Colony, and Neva was received with the utmost courtesy, and Bligh visited the ship, and invited the ship's officers in the evening to Government House for dinner and a ball. In his report to the RAC, the Captain noted everything at Sydney was most expensive, then his comments turned out to be most prophetic: " The soil is fertile, eventually one should guess this land will abound in bread and everything which is needed for life, and due to the short distance from China and the East Indies, as soon as local demand grows and products become recognised, a good trade will take place." He then went on to report that Russia would find: " advantage in trade with this part of the world, as all our products here are of a great value, and timber products, which are known as she oak are better than maghony wood for furniture, may be imported from here." He further made mention of the navigational advantages of the route from European Russia to Russian America with a call to " New Holland." praising the convenience of Sydney Harbour as an anchorage during far ocean navigation. It seems that Bligh and the Russian Captain developed a warm relationship, and the ball at Government House was a great success. At 11PM fireworks lit the sky, dinner commenced at midnight, and the dancing lasted until the very early morning. The Neva sailed on the 1st. of July, to arrive at Novoarchangelsk, the capital of Russian America in September. 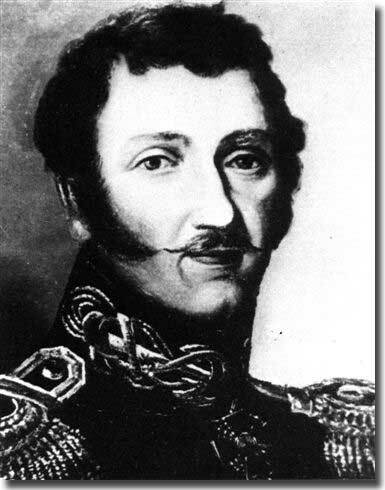 The Captain carried out two further navigational voyages, over 1816 - 1819, in Savorov, and in Krotkyi 1828 - 1830. He later became a Director of the Russian american Company, and the Director of a Merchant Navigational College. There is no doubt that Gagemeister Leontiy Andrianvich was a talented sailor, navigator and shrewd observer of the social scene that obtained when he was the first Russian Captain of a ship to visit Sydney Cove in 1807.
to honour the 150th. anniversary of the visit of Neva to Port Jackson.